In the last couple of months, both the main men in my life – my husband and my dad – sold their motorbikes: Breslyn, his Honda CBR 250cc, and dad, the Yezdi which he had for 25 years. 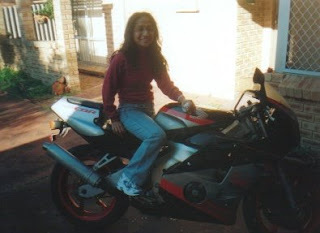 A ride on Breslyn’s Honda CBR was a thrill personified. Once we had donned our riding jackets and helmets, I’d park myself on the tiny back seat, give Breslyn the thumbs-up and cling on for dear life as he’d rev the engine and take off. Sometimes lazily winding our way through the Swan Valley, savouring the idyllic countryside. And sometimes speeding in a blur of sound and fury along the Mitchell Freeway in Perth. While doing 100kmph in a car barely makes a mark on your psyche, on a bike, it’s a total adrenalin rush. Every atom in your body pulsates, every fibre of your being responds to the sheer thrill of being alive. Young. Free. Vibrant. My dad’s Yezdi, in sharp contrast, was an old relic from the past. His “second wife”. Once a month, dad would give her the royal treatment - testing the spark plug, buffing her with Rubbing Compound, checking the oil and doing all those motorbike-related thingies that only guys get. During the monsoon, she even got a special coating of anti-rust and her very own “raincoat”! Weekends would see the four of us on our mandatory outings to my Nana’s House or Land’s End. Yes, FOUR of us on a bike - what a sight! Dad riding the Yezdi, mum demurely sitting sideways behind him, and my brother Jason and I perched atop the petrol tank. No helmets, no worries.